At their Philadelphia restaurant, VEDGE, Rich Landau and Kate Jacoby are redefining the concept of a vegan restaurant. This week, they'll be sharing recipes from their latest cookbook, giving away copies, and providing insight on how to make vegan cooking feel exciting and new. When we visited Kyoto, a few hours’ ride from Tokyo on the famous Bullet train, we found a little restaurant in the heart of town that won us over with the names of dishes listed on the menu: Firecracker Tofu, Pickled Mixed Radish Salad, and the mysterious sounding Okonomiyaki. The chefs were clearly having fun at this place, and we were blown away by the depth of flavor they achieved with such simple preparations. We threw back some sake and tore through plate after plate of food. 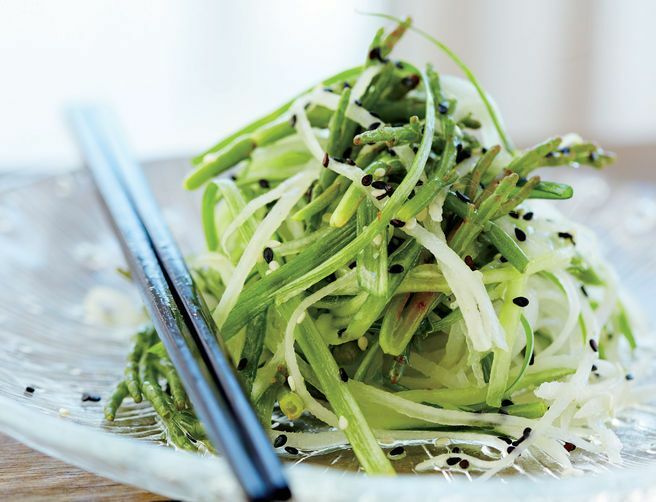 This salad is inspired by that meal, featuring quirky sea beans (a seaweed-like swamp/beach vegetable) and the haunting flavor of shiso (Japanese mint). You should be able to find fresh sea beans at a gourmet market; if they’re not available, substitute pencil-thin asparagus. Look for shiso in Asian markets, but substitute fresh cilantro if you can’t find it. Husband-wife team Richard Landau and Kate Jacoby are the chefs/owners of Vedge and the newly opened V Street in Philadelphia. Chef Richard Landau has been at the forefront of the vegetarian dining scene since 1994, when he opened Horizons Café in Willow Grove. His mission has been to take the carnivore palate he grew up with and use it to translate vegetarian cuisine to a broader audience. During more than five years at Horizons off South Street in Philadelphia, he continued to push the envelope of meatless cuisine. In 2009, he was invited to serve the first-ever vegan dinner at the prestigious James Beard House in Manhattan. He is proud to have helped shape the culinary landscape in Philadelphia and is excited to further raise the bar for vegetable cuisine. Chef Kate Jacoby joined Landau in 2001 to throw her full support behind Horizons, the restaurant she had already grown to know and love as a customer. Her work on the line beside Landau helped hone her pastry skills and shaped her approach to desserts. As pastry chef, she strives to innovate vegan desserts and bring fresh ideas to rich, quality ingredients. And, as sommelier at Vedge, Kate includes the bar among her responsibilities. Her appreciation and enthusiasm for wine is evident in the lovingly selected wine list. Landau and Jacoby are both Philadelphia natives. They spend as much of their time as possible traveling the world to find natural beauty, inspiring cultures, and exciting new foods and drinks.